Perhaps you’ve used the Library-purchased NBC News footage archive? This product now has available, footage produced by a selection of U.S. colleges and universities. The 2-minute (about) videos speak to specific educational programs and initiatives at a given institution. 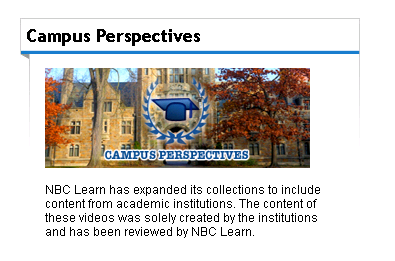 The complete collection, called Campus Perspectives, includes the ability to view videos by Topic or by Institution.